Wherever they sit, they stand out. Whether you prefer earth tones or bold colors, the Avery line is perfect. These planters have a design reminiscent of classic pottery, with a well-defined lip and flecks of color to give them that natural charm. Robert Allen "IronStone" planters look and perform like tradition heavy potter with less than half the weight. So if you are tired of lugging heavy pots around your home it is time to buy a light weight "IronStone" plant from Robert Allen Home and Garden. It's light weight. It's strong. It's resilient! 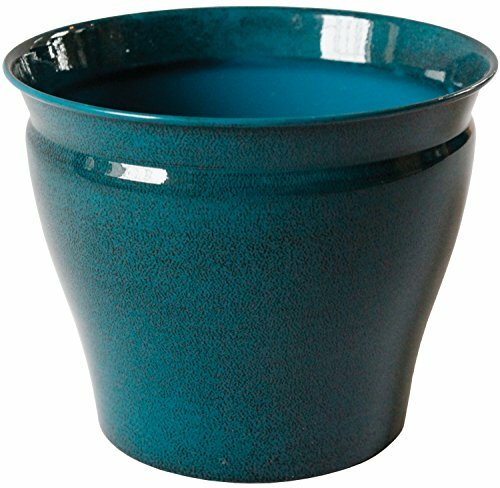 These glazed ironstone flower pots look ceramic, but are made using molded metal from re-claimed car door metal, a sturdy "spun metal, light in weight, and very durable"